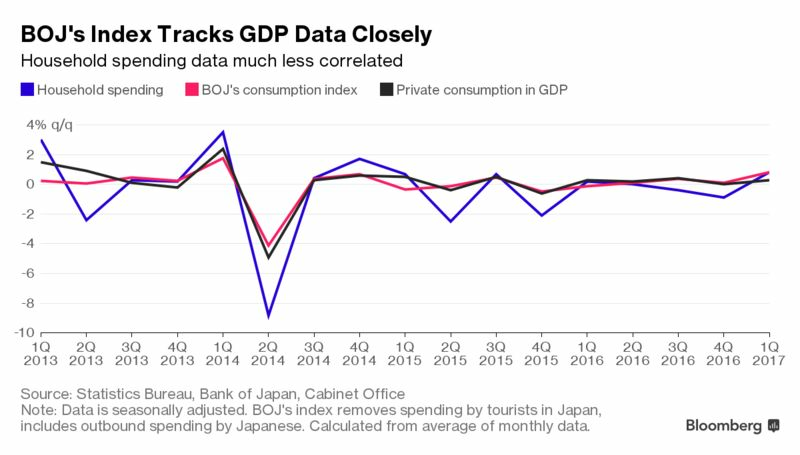 Private consumption is 56 percent of Japan’s GDP, so understanding where people are spending and what they’re buying is essential to have a clear picture of what’s going on in the world’s third-biggest economy. That’s true not just for the government, but also for businesses and people. But the government data on spending by households has long been seen as suspect, with a preponderance of older people in the survey, and under-reporting of online shopping at places like Amazon.com Inc. or Rakuten Inc.
To fill that gap, a venture firm has started using credit card transaction data to show consumption trends. Nowcast Inc., a financial-technology venture formed in 2015 out of the University of Tokyo, started releasing new consumption indicators created with JCB Co., a Japanese credit card issuer. “The government’s statistics aren’t grasping e-commerce spending enough, so the real state of private consumption could be stronger than what they are showing,” according to Ken Hirose, chief strategy officer at Nowcast. In addition, the data is released faster than government data, which comes out with a four-week lag. There were 81.6 million JCB cards and other accounts in Japan as of March 2017, and the annual domestic transaction volume of their credit cards, debit cards and prepaid cards was about 17 trillion yen ($153 billion), according to the company. The consumption indices take data from a sample of tens of thousands of card-holders, according to Nowcast. Finance Minister Taro Aso criticized Japan’s data collection in 2015, singling out the household spending data. Since then the government has started working to create a better measure, and the central bank has started releasing its own data on spending, which aimed to track closer with the measure of consumption in the gross domestic production figures. 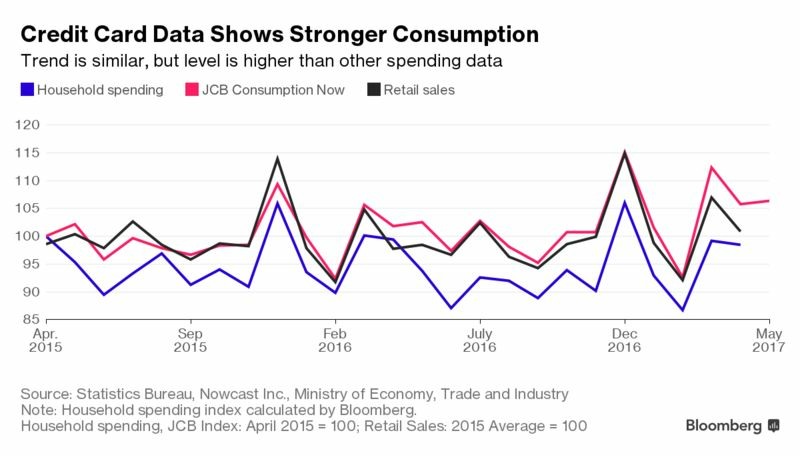 Japan’s Statistics Bureau plans to launch a new consumption index early next year. That will call on existing data as well as a new survey focused on spending by single-person households. In the long-run, the bureau is considering utilizing big data such as spending with credit cards or e-money, and point of sales data.